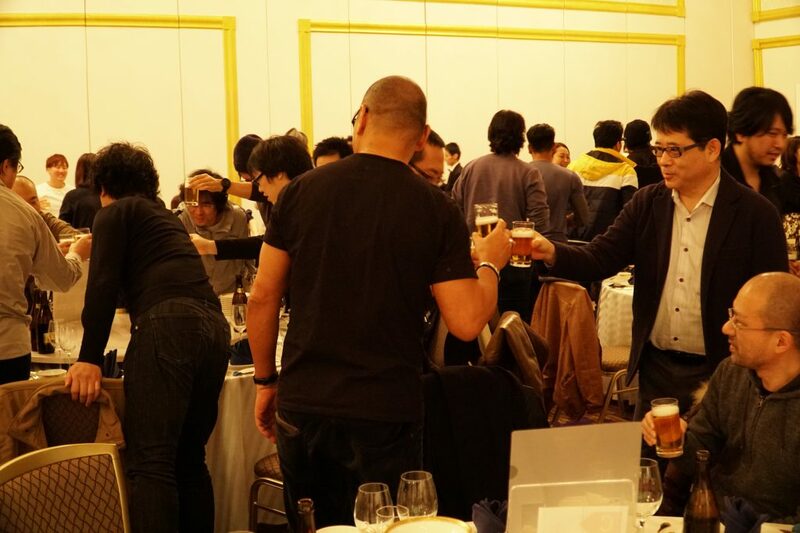 Last Thursday, with just a little more than a week left of 2017, all of us at PlatinumGames gathered for one of our annual traditions – the year-end party! 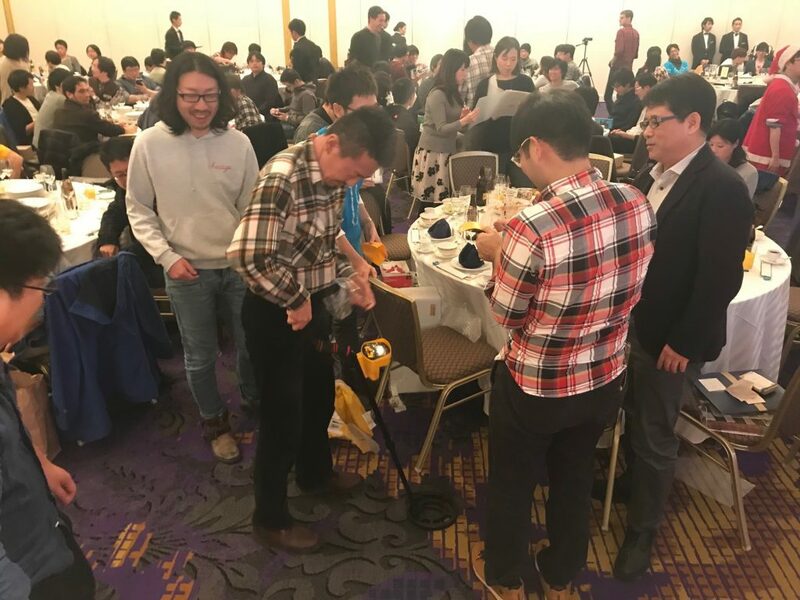 Between full-time PG employees and several guests from partner companies, about 200 people gathered to send off the old year and welcome the new together. President and CEO Sato kicks things off with a toast. 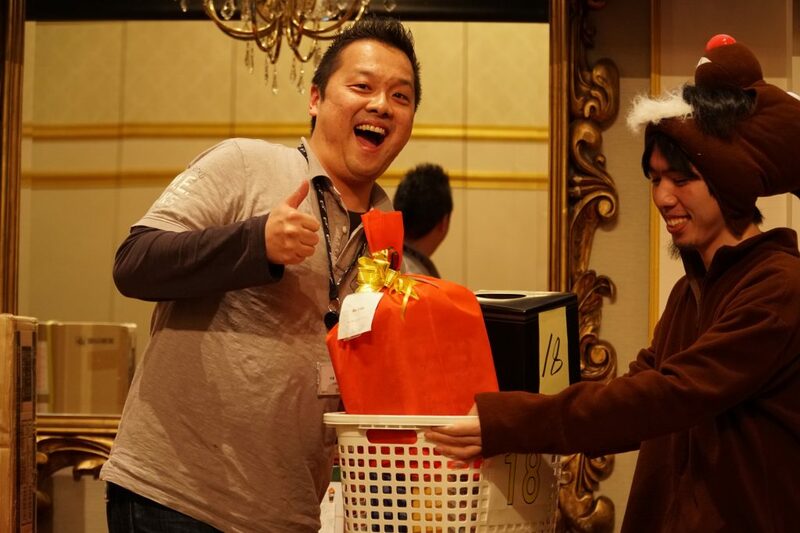 For years, the centerpiece of the PlatinumGames year-end party has been a bingo game, with prizes of all shapes and sizes brought in by Platinum employees themselves. 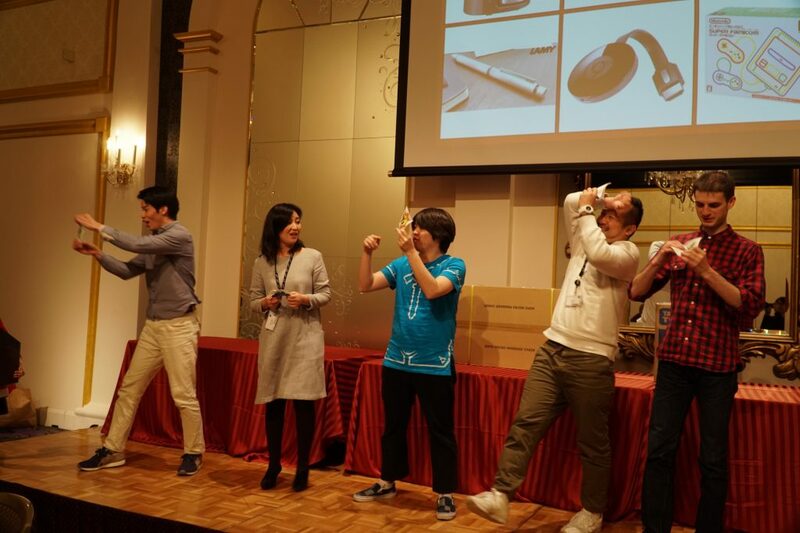 Our intrepid first-year staffers organize and lead the year-end party (you may recall they also run our springtime hanami picnics), and this time around they decided to buck tradition with a new game. Not least because the bingo game usually runs long, leaving less time for general merrymaking. As the party drew closer, the first-year staffers gathered up all the prizes that we brought in and divided them into themed sets. 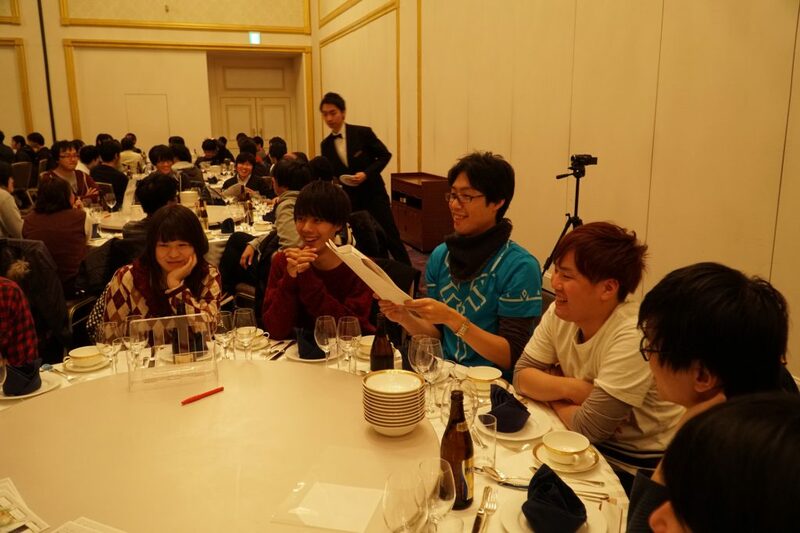 Each table in the banquet hall became a separate team, vying for the set they wanted most. 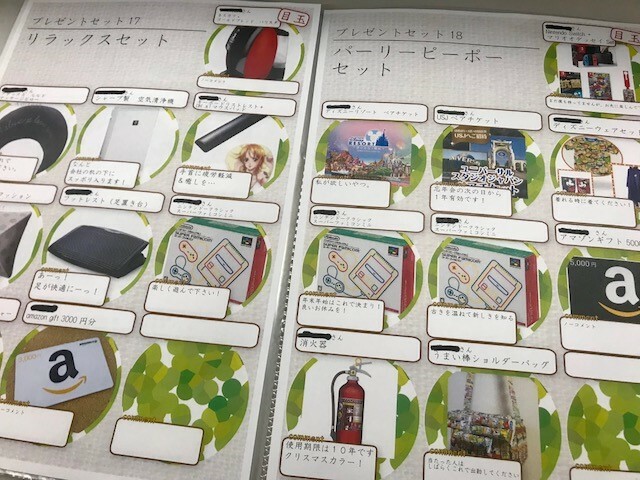 Some of the prize sets included the Health Set, full of things like a folding massage chair, health supplements and so on; the Gadgets Set, with a tablet PC and various home appliances; and the Beauty Set, with everything from aromatherapy kits to fancy spa passes. And of course the Gamer Set – full of games, consoles and peripherals – was much sought-after. 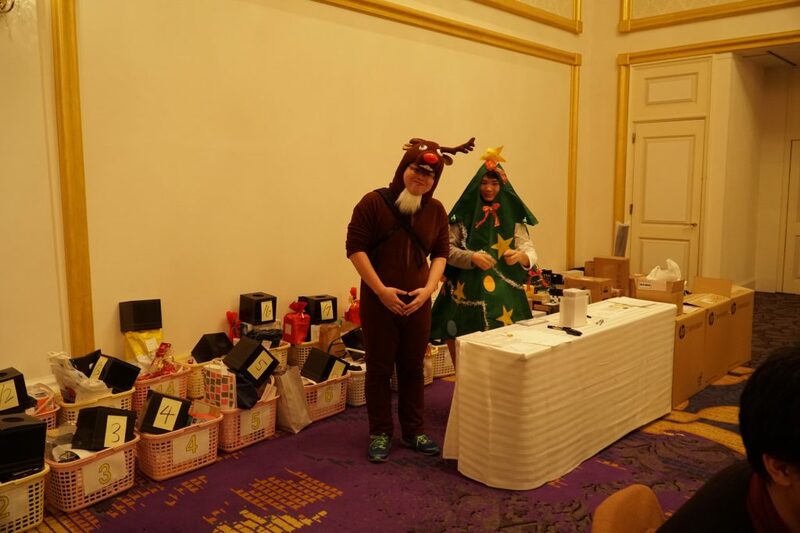 There were 18 prize sets total, with 176 gifts among them. 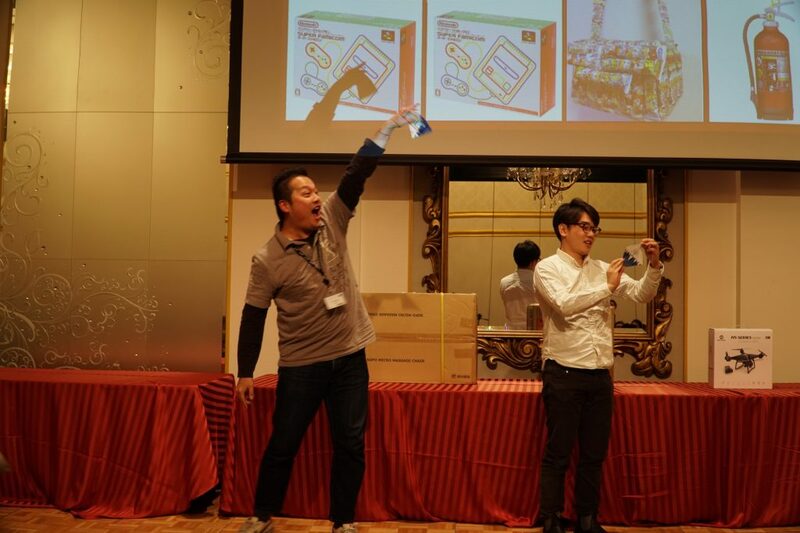 Super Famicom Minis were a popular gift this year. 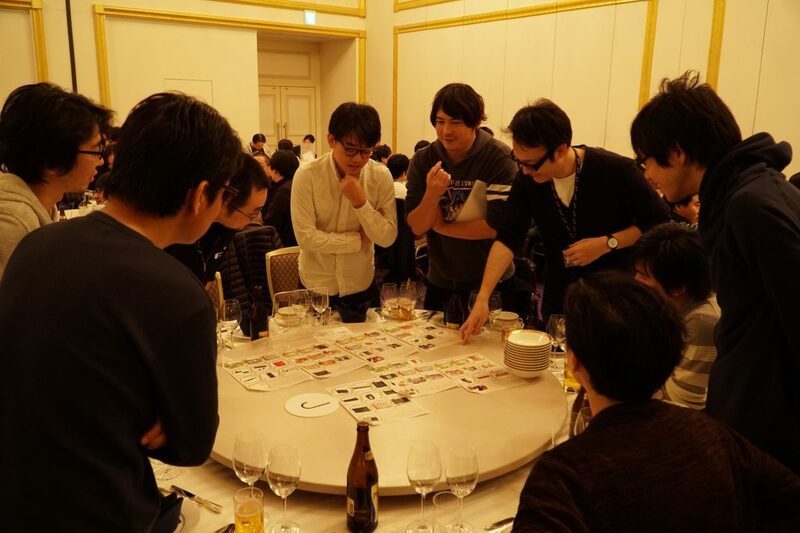 Each table discusses the sets until they agree on which they want most. A representative from the table writes that set on a sheet of paper and hands it in. If only one table wants a particular set, it’s all theirs with no fuss. But if two or more tables aim for the same set, their representatives have to go up front and draw lots for it. Tables that lose the lottery get a chance to start over with another unclaimed set in the next round. Once a table wins a set, they all draw lots to see who gets which of the set’s prizes. It takes a lot of strategy. Should you aim for a solid set you think the other teams might ignore, or shoot for the most desirable set and hope luck’s on your side? Of course, no team could know for sure which sets everyone else was gunning for until all the choices were in. 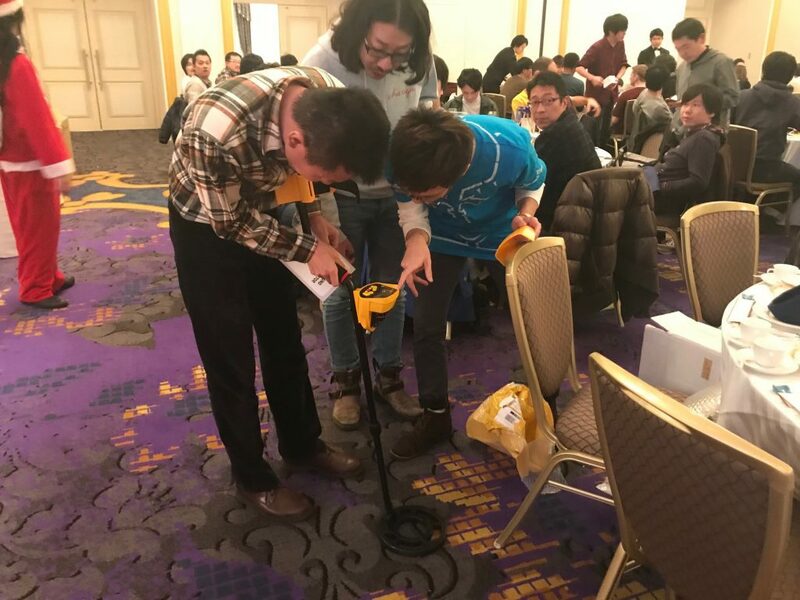 Teams only had ten minutes to plan out their gift-grabbing strategies. 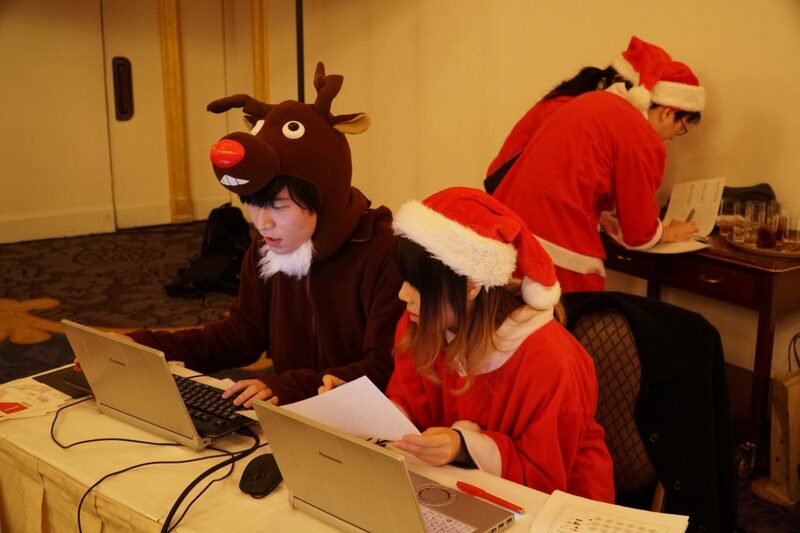 Costumed first-year staffers, hard at work. The lucky winner? 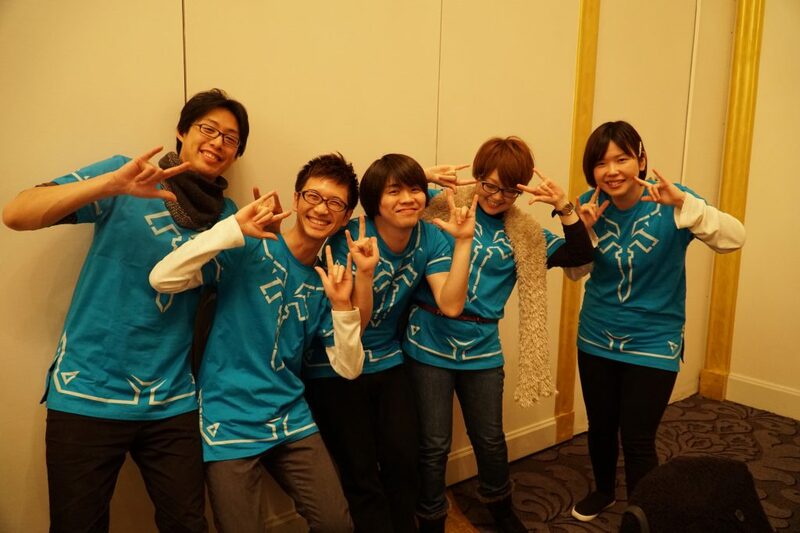 Character modeler Yoshikaze Matsushita, in blue in the center! 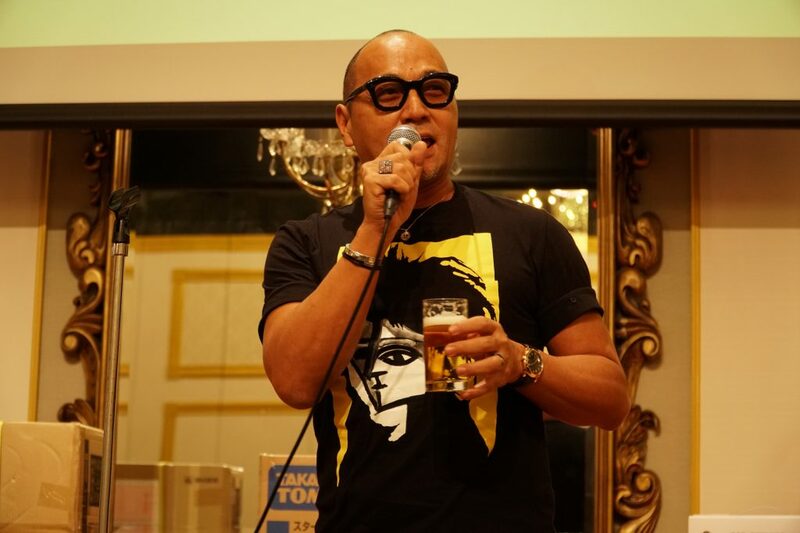 After every prize found an owner, studio head Atsushi Inaba put a bow on the party with his closing remarks. 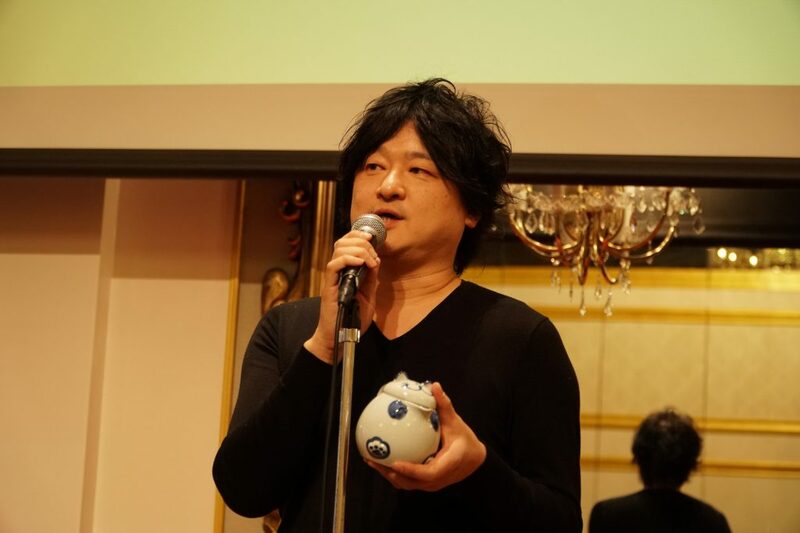 Here he is with his prize – a handmade cat-shaped pot. Turns out he’s a cat lover! 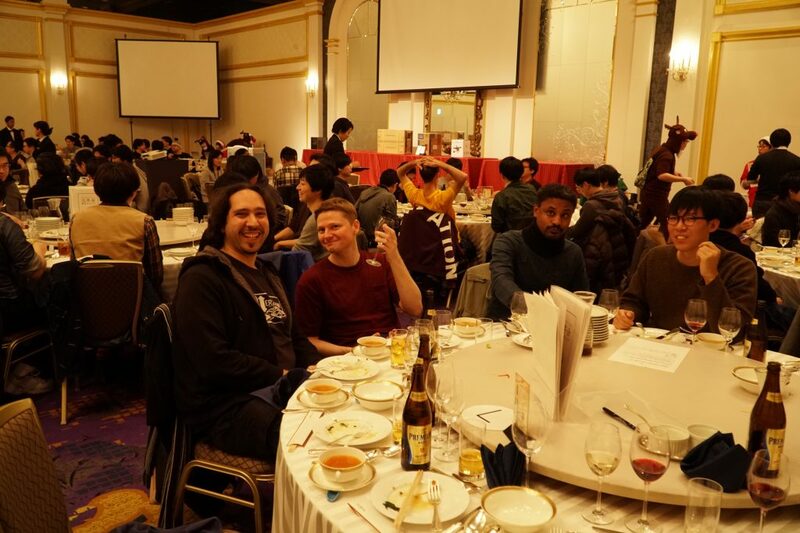 New Year’s Eve and Day are very major holidays in the Japanese calendar, so while most of us were hard at work on Christmas, we have a nice, long break to look forward to as December turns into January. But you can bet we’ll be back to work refreshed and ready to face the new challenges and opportunities 2018 has to offer! We hope you’re all having a great holiday season, and wish you a happy new year! It’s dangerous to go alone – take a few friends in matching T-shirts. 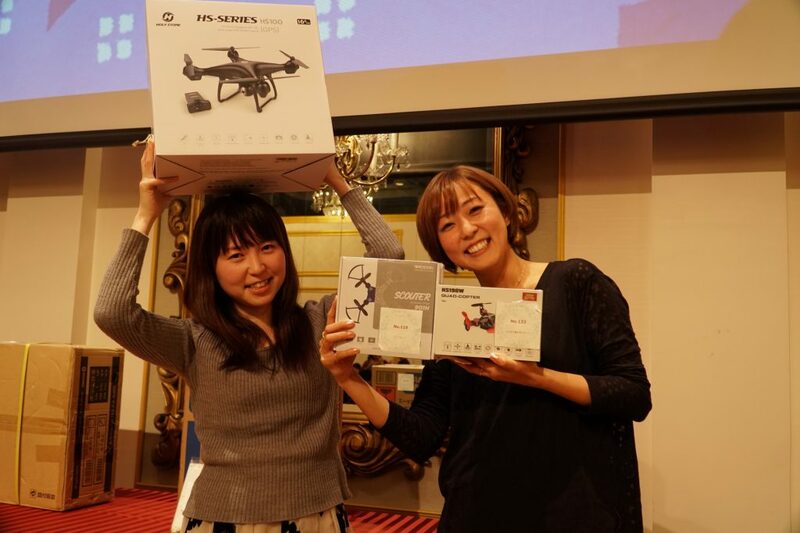 HR representative Yuki Abe and Kazuyo Tsukuma of the PR department will spend their holidays mastering the controls of their new drones. 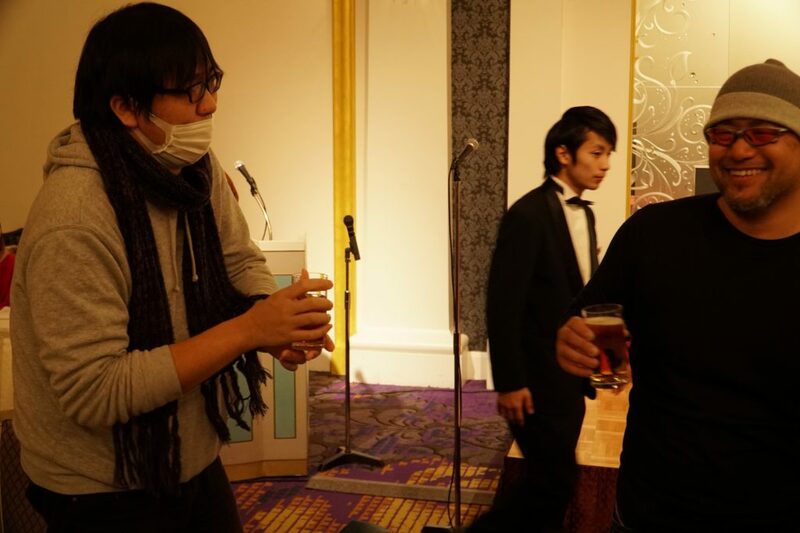 You may remember PR rep ICHI from his blog about Vanquish’s “God Hard” mode! 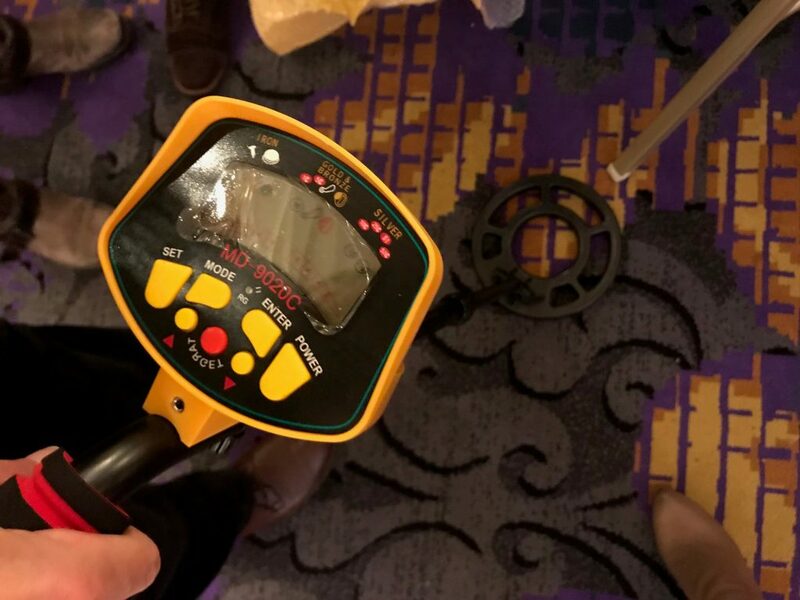 He won a metal detector – and wasted no time in the search for buried treasure. 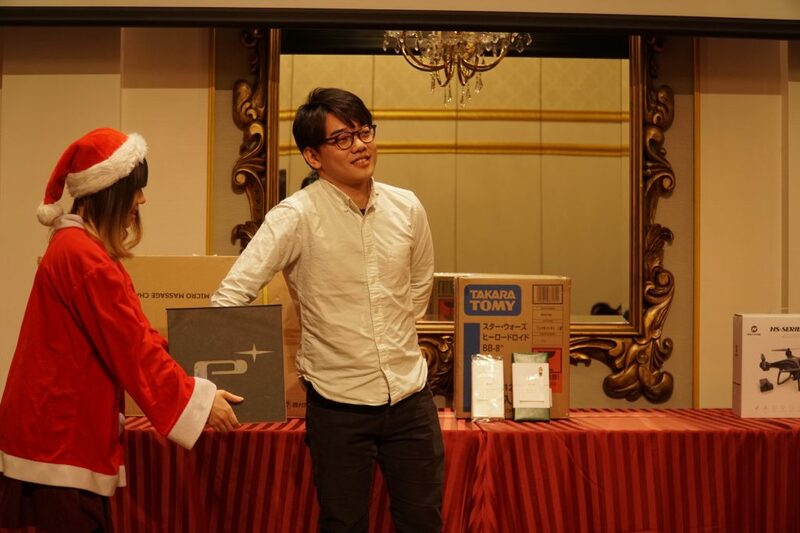 The year-end party is one of our biggest company events and never fails to delight employees of all stripes.